The Burmilla (which made such an impression on Liz in the early Huggibear days) originated as a cross between a Burmese and a Persian Chinchilla. The kittens from this first generation cross were silver tipped shorthairs since the genes for silver tipping and short hair are dominant. This cross has more of a Burmese appearance than a Persian one since the Burmese type appears to be stronger as can be seen from this picture of Amberlino Almushka. The emphasis was on breeding cats of Burmese type but with different colours and patterns, and so matings with Chinchillas decreased and since 2001 a cross to a Chinchilla has been treated like an outcross to any other breed. We said that the first Burmilla originated from a Burmese x Chinchilla mating. When Burmillas were at first produced they could be registered as Burmillas. In 2001 that changed. Since then, only fourth and later generations are reigsterable as Asian Cat Group breeds and not the first to third generations. In fact, any cat of an Asian Group breed (Burmilla, Tiffanie, etc) can only be registered as such if all its parents, grandparents and great-grandparents were of a recognised Asian Group breed or were Burmese. 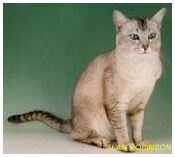 Liz's first stud cat was Sandy (Ch Huggibear Silver Sand) one of her very first Asian litter. He fathered many kittens including some who were sadly lost. One of Sandy's harem was a Chinchilla girl called Bonnie (Adouzlo Tipof Theiceberg) pictured right. At that time the usual first generation cross was Burmese x Chinchilla so Bonnie's litters by Sandy were rather unusual - but incredibly pretty! The last surviving female cat from those lines, Lucy (Huggibear Lucy Locket) was born the year after the rule change so instead of being registered as a Burmilla she is officially "black shaded silver shorthair of Asian type". Her kittens count as second generation. Lucy (left) was mated with Billy (Huggibear Billy Whizz), a Lilac Burmese (right). One of their offspring was Katie (Huggibear Sweet Kate) who presented us with the first litter that we registered for nine years. They count as third generation so the kittens they produce (if suitably mated) will be registerable as Asians (Burmillas, Tiffanies, etc) and can be entered in shows.